Herzog’s Long Term Respiratory Care Unit for Adults is the largest of its kind in the country, providing care for over 100 adult patients. Due to constant pressure and demand for more beds, the department continues to grow and expand. In previous years, there have regularly been 25 - 30 patients on the waiting list to be hospitalized. As a result of medical technology advancement, the respiratory need is growing rapidly while also enabling doctors to treat an assortment of patients where previously there was no help possible. A new, larger and custom-designed department will be housed in the new Samson Medical Pavilion (which is currently under construction) and will occupy a dedicated respiratory unit. It will offer much needed space and facilities for the growing number of patients requiring this specialized care. Incorporated in the new Pavilion will be state-of-the-art visitation areas for families to visit and spend time with their loved ones. Children represent a unique challenge in this highly specialized field. Congenital defects, genetic diseases or trauma caused by accidents or malice (such as falls, drowning, car accidents or terror attacks) cause injuries that are so severe that a child requires continued support of a respirator to breathe. The Unit treats children from 3 months to 18 years from all walks of life and denominations, and the demand continues to grow. This is the largest such department in Israel. 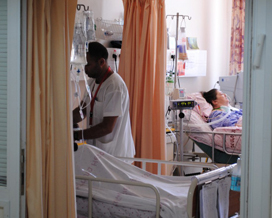 Patients in this unit just like the entire hospital come from all over the country – from as far away as the Negev and the Galilee and from backgrounds as varied as Bedouin tribes and Arab families from the West Bank to ultra-Orthodox families from the Mea Shearim neighborhood of Jerusalem. Due to increasing demand, the number of beds for children is being doubled with the new construction.